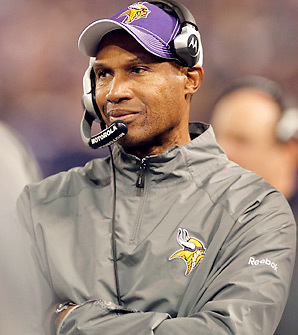 On January 3, 2011, the Vikings and Leslie Frazier reached an agreement making him the permanent head coach. In his first season as head coach, the rebuilding Vikings went 3–13, their worst season since 1984. On December 5, 2011, Vikings owner Zygi Wilf stated Frazier would return in 2012. In Frazier's second full year as head coach, the Vikings improved to 10-6, making the playoffs. The biggest single-season turn around in Vikings history resulted in Leslie Frazier finishing fourth in voting for the NFL Coach of the Year Award and the Vikings exercising their fourth year team option to keep Frazier under contract through 2014.